Spring is supposedly sprung but in London it all feels a bit like a cruel joke. Ever since last month when ‘The Beast From the East’ unceremoniously dumped the contents of Siberia’s skies on us it has been an endless cycle of torrential rain, biting winds and pavement slush. For me the only real signs that balmier days are on the way have been in the farmer’s market. After months of warming, wintery bowls of earthy, roasted roots and grains I am now really starting to crave fresher, greener fare. As a chef (and general glutton) the explosion of young spring vegetables in the market stalls this month has sent me into a bit of a buying frenzy as finally I can drop the celeriac and fill my bag instead with long awaited spring time goodies (before heading home through the icy gale). In celebration of this glut of new season produce I thought it was about time I resurrected the ‘Well Seasoned’ Series to showcase some of the best that Spring has to offer. 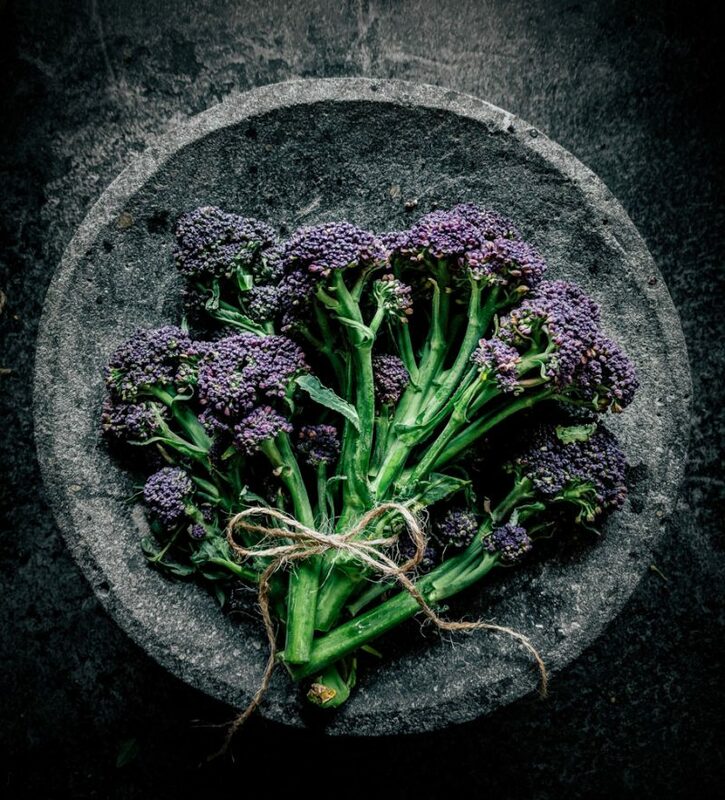 One of the first spring vegetables to make an appearance is sprouting broccoli, in all its purple (and occasionally white) glory. 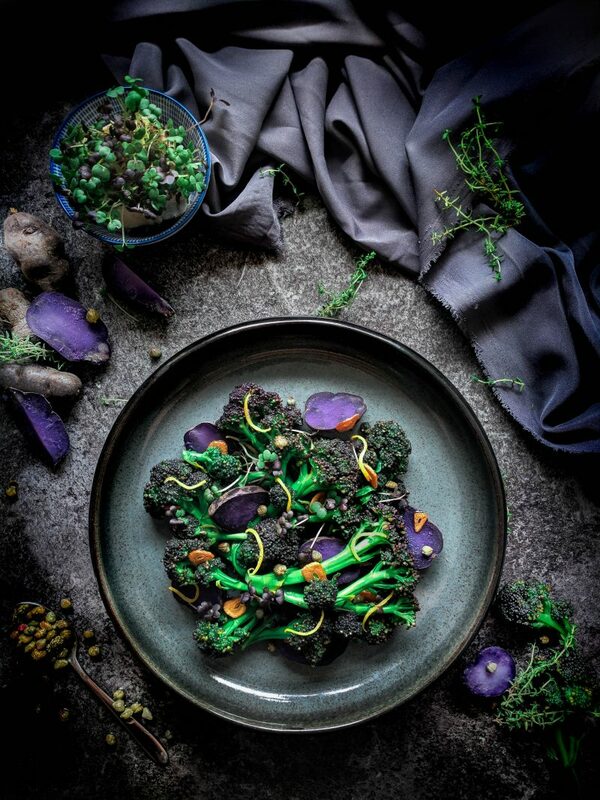 I am a big fan of broccoli in all its guises, but this really is the king of the clan – pleasingly decked out in royal purple. With its tender stems and dainty florets you would be forgiven for assuming that this delicate looking plant might wait for milder days to flourish but it is actually a hardy beast that (unlike me) will happily battle through whatever winter throws at it. 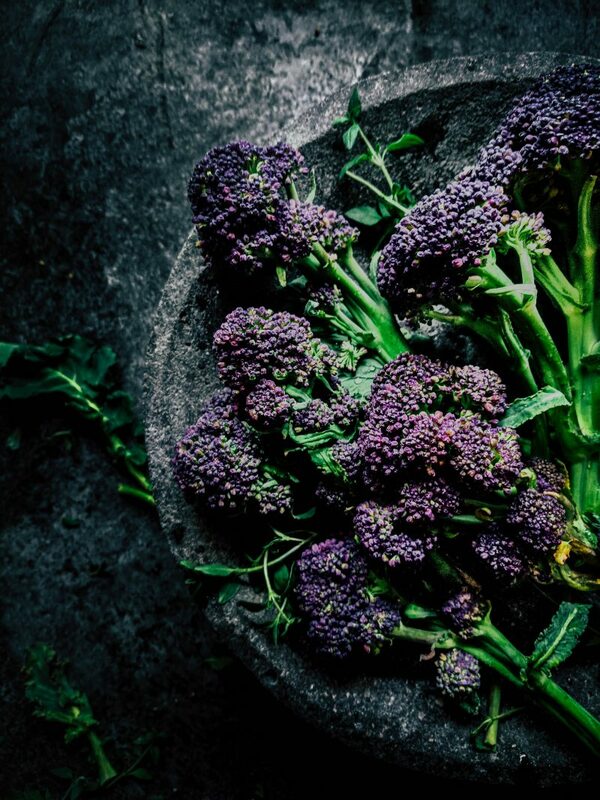 More often than not I will blanch the spears in salted, boiling water, throw them on a smoking hot chargrill and then shower them with toasted almonds, but purple sprouting is a versatile and delicious addition to so many springtime dishes. I am particularly partial to it folded through bowls of fresh pasta with some fiery chilli and a generous grating of parmesan. Equally you can toss blanched handfuls of it in garlic butter and pile it high on toasted sourdough with a poached egg or two to give your weekend brunch an interesting seasonal edge – frankly you toss just about anything in garlic butter and I would say that you were on to a winner! 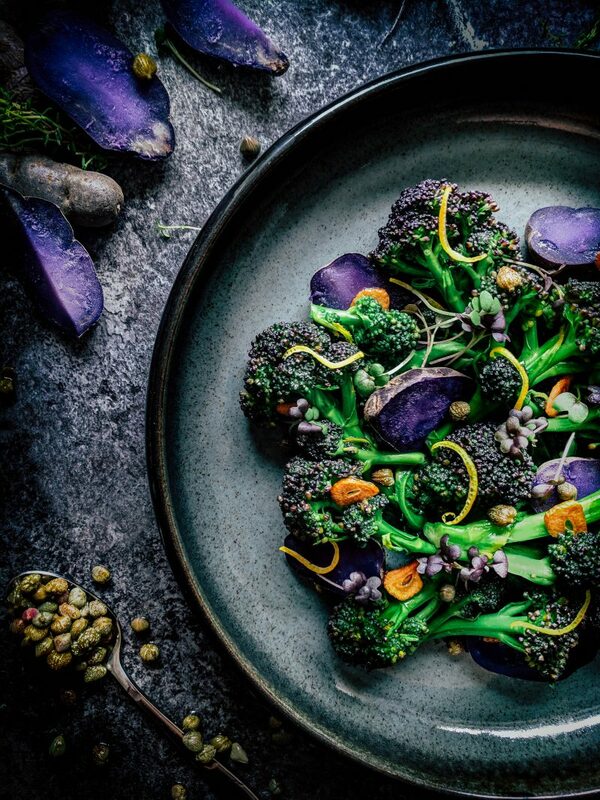 In this recipe – a celebration of all things purple and green – I team the broccoli with vibrant violetta potatoes, garlic, capers and lemon zest to make a punchy spring dish that is a lovely accompaniment to grilled chicken or fish but is feisty and interesting enough in its own right to serve, as it did today, as a simple spring lunch. This really is a perfect way to showcase this glorious vegetable, plus the zing of the lemon and capers teamed with a drizzle of fruity extra virgin olive oil really do hint at the warmer days that are (hopefully) just over the horizon, when maybe we’ll see the sun again and I’ll stop complaining! Violetta potatoes are a beautiful vibrant purple potato slightly larger than a Jersey Royal. If you can’t get your hands on any then obviously any new potato will work here…they just may not be quite as aesthetically pleasing! 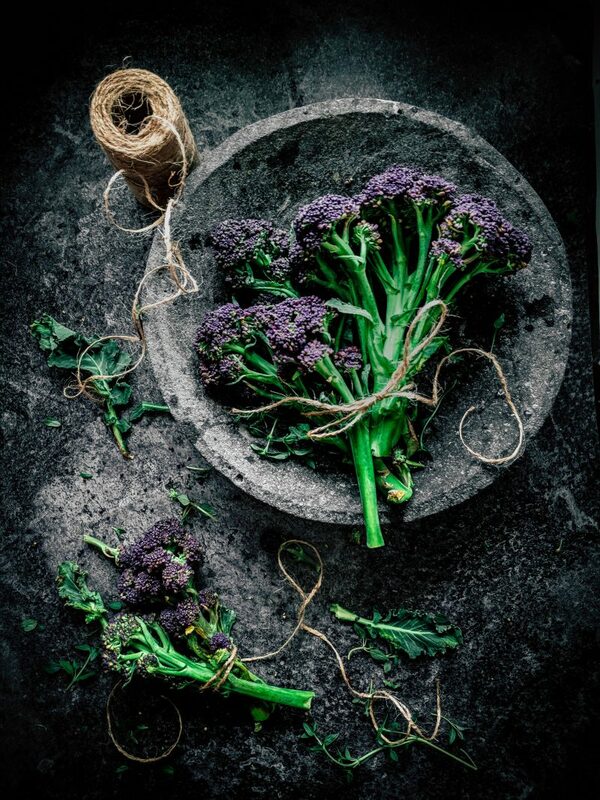 Remove any woody, dry bits from bottom of the broccoli stems. If any of the spears of broccoli are very large cut them in half lengthways. You want all the spears roughly the same thickness so they cook evenly. Set aside. Bring a small saucepan of salted water to the boil. Add the potatoes and simmer for around ten minutes, or until tender (this will entirely depend on the size of your potatoes). Drain and set aside. Heat the olive oil in a small pan and add the sliced garlic. Fry gently until the garlic is golden and crisp. Be careful not to let it burn. Transfer the oil and garlic to a small bowl. Bring a large pan of salted water to the boil. Add the broccoli and simmer until just tender – you want the stem to still have a bit of a crunch. Drain and place in a large bowl. Slice the potatoes into halves and add to the broccoli along with the capers, lemon zest, the garlic and the oil it was fried in. Toss together and season to taste. Drizzle with extra virgin olive oil and serve.